Lenin is said to have declared that the best way to destroy the Capitalist System was to debauch the currency. By a continuing process of inflation, governments can confiscate, secretly and unobserved, an important part of the wealth of their citizens. By this method they not only confiscate, but they confiscate arbitrarily; and, while the process impoverishes many, it actually enriches some. The sight of this arbitrary rearrangement of riches strikes not only at security, but at confidence in the equity of the existing distribution of wealth. Those to whom the system brings windfalls, beyond their deserts and even beyond their expectations or desires, become “profiteers,”, who are the object of the hatred of the bourgeoisie, whom the inflationism has impoverished, not less than of the proletariat. As the inflation proceeds and the real value of the currency fluctuates wildly from month to month, all permanent relations between debtors and creditors, which form the ultimate foundation of capitalism, become so utterly disordered as to be almost meaningless; and the process of wealth-getting degenerates into a gamble and a lottery. – J.M. Keynes, The Economic Consequences of the Peace. Capitalism deserves a moral defense, but even those who appreciate the moral superiority of capitalism sometimes find themselves ill equipped to offer a clear response to critics. A new book from the Atlas Economic Research Foundation, Students for Liberty and the John Templeton Foundation aims to provide just that intellectual ammunition. The Morality of Capitalism, edited by Cato Senior Fellow Tom G. Palmer, gathers a diverse group of scholars, writers and business leaders from across the globe to extoll the virtues of capitalism. I recorded a quick podcast (Subscribe!) with Tom about the book and its authors. When you look at criticisms of the market, in many cases, what they’re complaining about is interventionism and cronyism, not really capitalism…. On the moral level[, we need to take the offensive and make the case for capitalism. 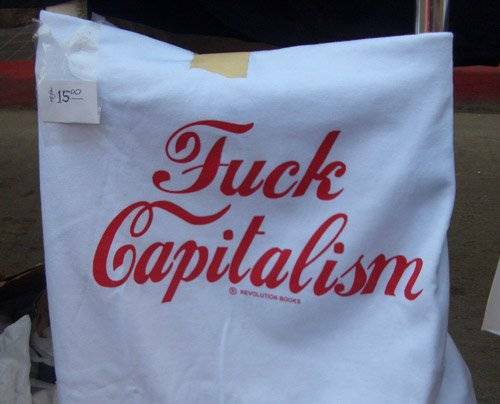 That’s what this book, The Morality of Capitalism, is about…. What distinguishes capitalism is a legal and moral relationship among persons. That people have the right to pursue their dream, the right to do what they want with what is legitimately theirs under a system of the rule of law and equality before the law for everybody, not privileges for some or some have special powers as planners or dictators. But all of us meet in society as moral and legal equals and we trade and exchange. The outcome of that is morally just. It’s not just that it’s more productive… at its base, people have a right to exchange, they have right to transact freely, and the state or self-appointed planners don’t have the right to tell them otherwise. Student groups can get bulk copies shipped to them from Students for Liberty. Even many of the nation’s staunchest neoliberal economists, who have long advocated laissez-faire policies, acknowledged that the ideas of F.A. Hayek, Ludwig von Mises, and Milton Friedman cannot account for how Edible Arrangements operates from more than 1,000 locations in 13 countries, including Hong Kong, Italy, India, and Kuwait. Whole Foods CEO John Mackey talks about health care and capitalism. Moore here is basically incoherent. No matter, though. The point in posting this is that you can get the shirt the kid is wearing here. The Cuban government, in its most dramatic reform since Castro took over for his ailing older brother Fidel three years ago, is offering private farmers such as Fuentes the use of fallow state lands to grow crops — for a profit. They are paid in cash, which Fuentes appreciates, and they are not told what to plant. Seems such a basic thing, so I wonder what self-described socialists honestly think on the following question: Do you have to believe that farmers need to be told what to plant in order to be a street-credible card-carrying socialist? If central planning means anything, doesn’t it mean someone in a position of authority over the farmer telling him, if nothing else, what to plant? If people shouldn’t be trusted to arrive at the most socially beneficial price for a good, why would they then be able to produce the most socially beneficial amount of corn/wheat/vegetables? Is Raul Castro perfecting socialism? Is he abandoning it? Naomi Klein has been pretty hard on ol’ capitalism. She argues that capitalists lie in wait for opportunities to deregulate markets and privatize infrastructure. All those capitalists need is a crisis to give people a shock so that otherwise abhorrent laissez-faire Friedmanite policies can be adopted before the public returns to its senses. Of course, she argues, it’s bad to cram these reforms down the throats of people when their reasoning minds are gripped by shell shock. It’s just downright impolite. She may be right on the politeness issue. But if we take Klein’s comments seriously, does she mean to suggest in her writings that only capitalists should apologize when they want to make changes to the size and scope of government in the face of upheaval? Or is it that when capitalists make those changes, that’s when it’s a vile conspiracy?